On Menorca you will never be more than 10Km from the Mediterranean and will therefore benefit from it's cooling effect in the summer and warming effect in the winter. The highest point in the centre of the island is 358m and is unlikely to cause much in the way of a localised climate. 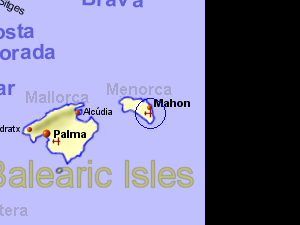 The average rainfall for Mahon is 616mm or 24 inches (Source: World Climate), with most falling September to May. The wettest months being October to December.